Vomiting bile is something no one wants to experience, but when you do, be sure to be wary of the color of the bile. Granted, the color may be due to the food consumed that did not reach the stomach, but the green vomit or yellow vomit may be an indication of more serious health problems that may require immediate medical attention. Nausea combined with bowel movements is considered a normal way of the body ridding itself of dangerous toxins, but the color may point out if the toxins have been completely removed. Note that if throw up too much bile, the vomit will likely be greenish yellow. Listed below is a comprehensive list of the possible causes. Since the bile is stored in the liver and gallbladder, if you have a surgery which removes the gallbladder or an infection of the liver, the bile from these organs will mix with the stomach acid and be emitted as green vomit. While often the result of a gallbladder removal surgery, it may also be a sign of a major infection. Alcohol and medication can irritate your stomach or gastrointestinal tract, which may cause vomiting. 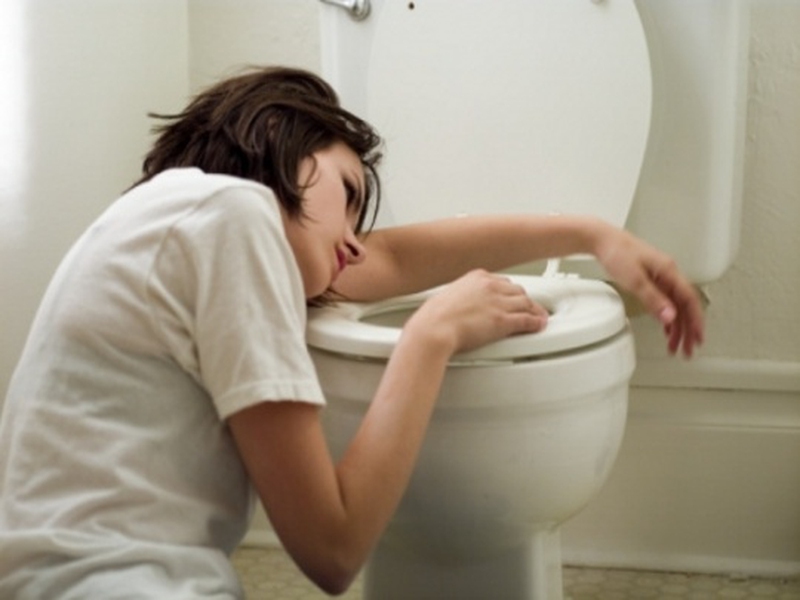 Too much alcohol intake can cause vomiting. Especially when the drinks are mixed with bad food or food poisoning, it can lead to excessive vomiting, and at last you will have green vomits. Also, some alcohol like cocktails colored with dyes can bring color to your vomiting as well. Apart from alcohol, medication like morphine can be a trigger to your stomach, making the chemoreceptor trigger zone active, and then causing vomiting. Food may cause an episode of green vomiting if one either consumes poorly prepared food, or a food to which they are allergic. For example, if you ate at a restaurant with undercooked chicken, you may get food poisoning and soon be throwing up bile. Likewise, you may suffer from expelling green vomit if you consume a food you either know, or do not know, you are allergic to and should not have consumed. After eating, the food moves at regular intervals through the digestive tract in order to be expelled through a bowel movement. When there is an obstruction in your bowels, the food will be forced upwards even after being partially digested, and be emitted as vomit mixed with green vomit. When you begin throwing up bile, it is often your body’s defense mechanism of attempting to rid itself of all dangerous toxins, even though you feel as though there is still nothing left in your system. In these cases, be sure to stay well hydrated and consult medical attention if the vomiting does not stop. Sometimes vomiting occurs for no particular reason. If this happens to you at least three times in a six month time frame, then you may be suffering from the mysterious and currently incurable Cyclic Vomiting Syndrome. Once you begin to see green or yellow vomit, or are regularly throwing up bile, you will want to seek medical attention, especially if the bile has been seen on more than one occurrence within subsequent vomiting episodes (such as within the same day and/or week). While this may not warrant a trip to the Emergency Room, it should be cause to see a doctor to rule out any potentially serious underlying conditions. The presence of bile has indicated the malfunction of the liver, which is essential to the overall bodily functions working properly. Even if there was only a short burst of vile appearing in your vomit, it is better to be safe and get checked out than to leave it to chance, because the earlier an issue is discovered the more likely you are to recover. These supplements can be used to remove bile from the system, which may help prevent the continuation of throwing up bile either due to bile reflux or other gastrointestinal disorders. As such, bile acid sequestrates are not typically prescribed unless there is a distinct medical reason for their use as those who suffer from the above condition needs a way to protect their esophagus lining from the damaging and eroding qualities bile may have. Sometimes throwing up bile is completely out of your control because you are suffering from food poisoning or the flu. If this is the case, you may find it difficult to keep any food or liquids down, but at least keeping yourself hydrated will prevent your condition from worsening. When you suffer from food poisoning and have green vomiting, one of the most important nutrients to consume is electrolytes as these will help replace potassium, sodium, and calcium in your body. Without these three key elements, your body will not be able to correctly recover and remove the damaging food particles. Aside from food poisoning, another common vomiting trigger is actually food allergies. While staying away from foods you're allergic to is the best answer, more severe allergic reactions may require the use of epinephrine. If your young child begins throwing up green vomit, it could be an indication of a serious medical condition or birth defect in the liver known as a meconium blockage. Other possibilities include stomach flu, or volvulus (twisted bowel syndrome). Seek medical care or a test to rule out possible concerns. Get plenty of rest to help your body recuperate. Allow yourself to vomit when you feel the urge - don’t try to prevent it. Keep a glass of water nearby and sip on it regularly in order to stay hydrated. Use a cold or hot compress to help the suffering patient relax. Eat smaller meals throughout the day rather than three large meals. Don’t eat immediately before bed. Drink some cranberry juice or lemon water to help soothe the stomach. Chew on ginger or sip on ginger tea, make and sip on aniseed tea, or sip on green tea. In general, discharging green vomit is not alarming, but stress will only make your condition worse. Calm down your moods and visit your doctor do some checkups for potential issues. Keep a close watch on your diet and daily routine to see what may be a trigger for these episodes. Now you know about about green vomits causes and ways to manage it.